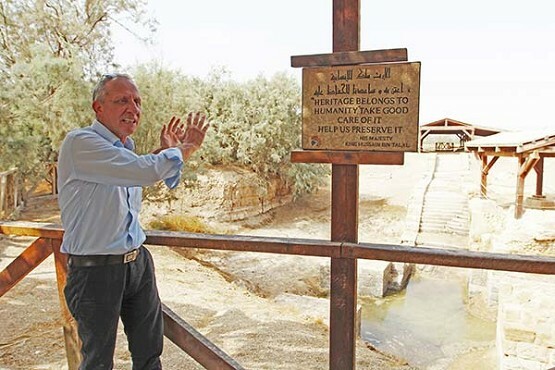 Rustom Mkhjian, who oversees archeology at the baptism site of Jesus, speaks just above the place where scholars believe John welcomed Jesus into the water. 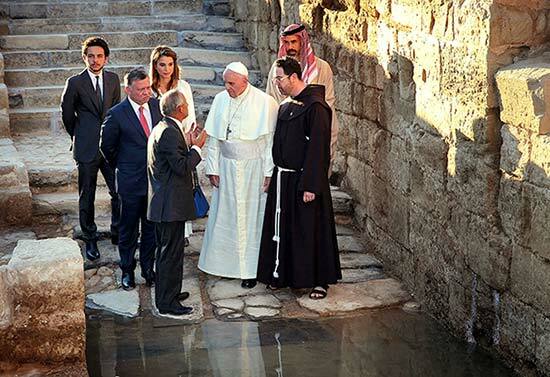 Rustom Mkhjian explains the site to Pope Francis along with King Abdullah II and other members of Jordan’s royal family in 2014. In 2012, during his visit to Jordan, Russian President Vladimir Putin attended the inauguration of a house for Russian pilgrims at the baptism site of Jesus. Prince Talal Ghazi Bin Muhammad of Jordan also attended. The nation of Jordan gave the land to the Russian Orthodox Church and then to the Russian Federation. Moscow paid for the project. The house is home to a community of Orthodox nuns and has a walkway to the Jordan River. “The traditions of mutual understanding and mutual enrichment of cultures and ways of life have always been strong here,” Putin said. Under construction next door is a large Roman Catholic Church and retreat center due to open in the coming years. “I baptize with water,” John replied, “but among you stands one you do not know. He is the one who comes after me, the thongs of whose sandals I am not worthy to untie.” This all happened at Bethany on the other side of the Jordan, where John was baptizing. Video at bottom of story. AL-MAGHTAS, Jordan — A rustic, brushy depression north of the Dead Sea is more holy than anything at the Vatican. That’s the educated declaration of Rustom Mkhjian and it’s hard to argue with him. Mkhjian helps oversee the site along the Jordan River confirmed by archeologists as the most likely place where John the Baptist brought Jesus into the water. Baptism began Christ’s public ministry, giving birth to Christianity. Mkhjian has kept trams, pavement and trinket sellers away, convinced it’s best to conserve first century conditions at the baptism site and in the surrounding stark gullies where John the Baptist lived, roamed and preached. Visitors can walk miles of level trails, some covered to protect from the sun. Near the river, there is vegetation and birdsong. This being a river, there are flies, but they don’t bite. The insects don’t come in swarms, but only in pesky pods when visitors stop moving. Not far away, the desert sets in. The “Wilderness of John,” as it’s called, is well below sea level and the heat can soar. That’s all part of the authentic experience, Mkhjian explains. At night, the lights of Jerusalem twinkle across the river and Israeli guards keep an eye out for illegal crossings. The site was already an important location in the first century and John probably chose it with tradition in mind. After Moses’ death on nearby Mount Nebo, Joshua led the freed Hebrews to the promised land across the river. Across from Jericho, one of the oldest continuously settled places on earth, the fjord was used by important prophets like Elijah to cross between Jerusalem and the wilderness and communities to the east. Scripture makes it clear that John came in the spirit of Elijah, and intended to continue Elijah’s message. Early Christian pilgrims documented their visits to the crossing. The end of the Byzantine era and shifting trade routes brought about a decline east of the Jordan; pilgrims, out of convenience, began to stay on the west bank to commemorate the baptism. Layers of history exist at the baptism site: from Jesus’ time, the Roman period and medieval times. The militarization that began when Israel was created may have preserved the relics, which were fenced off and guarded for decades. Up to a few decades ago, both banks were studded with explosive land mines. But the 1994 Jordan-Israel peace treaty led to mine removal and systematic archeological excavation on the eastern side. The digging led to the 1996 re-discovery of the location where John had been living and carrying out his baptisms. The Jordanian royal family pays for the ongoing project. Mkhjian says today’s pilgrims can re-trace the footsteps of the early Christian tradition by visiting the cave where John the Baptist lived and carried out his works. The cave was transformed into a church in the second century by monks living in what is thought to be the first monastery east of the Jordan. The water channel and the church, which is built around the cave, have been excavated and are open to viewing. Hermit caves dot the area and are open to viewing, though some require a climb. Mkhjian points out that the entrances face Jerusalem. Closer to the Jordan River are the remains of five memorial churches built by early believers. Some were described well into the Islamic periods, a sign of Christian-Muslim coexistence in Jordan that continues. About one in 10 visitors to the baptism site is Muslim, since Jesus is seen as a great prophet in Islam. Earthquakes, flooding and demographic changes led to the closure of the monastery and churches in the medieval period. Pope Francis visited the site in 2014, speaking to an audience of refugees from Iraq and Syria and youths with disabilities. The pope thanked Jordan for welcoming refugees and ask other nations to join in. Many people are still baptized in the Jordan, usually downstream from the Jesus’ baptism point. Mkhjian notes that the Dead Sea elevation here is well below sea level.